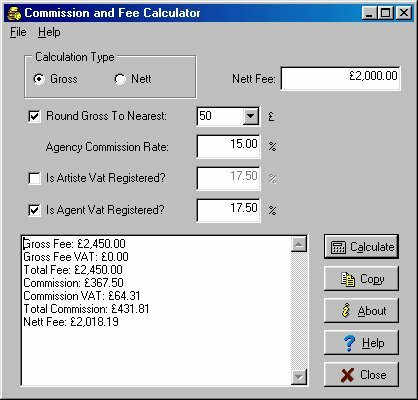 This is a simple utility application to calculate the Gross or Nett fees of Artistes. The need for the application became clear when users of our Agency Management Software were trying to work with another Agent on a number of shows, and the Artistes wanted a particular nett fee. However, the amount to be charged to the Client had to be calculated to include the split commission, and the VAT on the commission, whilst still leaving at least the original nett fee as quoted. In that situation you can't just add the percentage to the fee, because it comes out all wrong and you end up having to juggle the commission (usually losing money in the process) to make it happen. Even if you do calculate it correctly, it will come out at a silly figure once the VAT is added... so let's round it up to the nearest £5, £10, £25, £50 or whatever, shall we? Multiply that by the 30 or so acts we were trying to book and you get some idea of how awkward the problem was - calculator burn out in no time! There were also some situations where acts wanted to know how much would be left for them out of a gross fee after paying the commission and VAT. Simple enough with a calculator, but surely there has to be an easier way? Now there is. To solve the problem we wrote this small utility that can sit on the desktop and be called up at any time - type in a fee, hit the Enter key and the answers are there in front of you. You can even copy all or some of them with a single click and paste into emails, letters, or even AcePlus if you need to. It can calculate gross from nett or nett from gross, it knows about the VAT status of Act and Agent, and you can control all the percentages and other settings - for each usage. You can try 'what if...' scenarios by running multiple calculations on the same fee. It doesn't care about the currency you use, and will automatically pick up the currency setting from your computer at run time - our users in the States and Europe (or indeed elsewhere) won't have to work with £ signs! It even knows to ignore VAT when both Agent and Artiste are VATted and remembers the settings you make each time you use it ready for next time.